I began by noticing. Nothing much happened for a while but I was pretty calm minded. Around 5 minutes in I started to perceive the colorful clouds and sparkles that often appear when putting pressure on the closed eyes. Around 7 minutes in I started receiving information that this session would not succeed. I pushed those thoughts away, although they were quite persistent. I didn't feel any attachment to them, need for success or expectations, yet I felt a deep knowing that they were correct, much like precognition. By the time 10 minutes came around I had not begun to perceive any kind of depth in the darkness. I decided to move on with the exercise anyway and begin the visualization part. I started by imagining a native American canoe with a small paddler inside. The launch site was a boat ramp in my home town. The canoe was put into the water and it just floated there doing nothing in particular. After a short while the scenario seemed to become restless and start to teleport the canoe from one location to another, right out to the middle of the ocean then back again. I did as little as possible to drive scenario, simply returning the attention to it if it wavered, which wasn't a huge issue but did occur a few times. Overall the scenario remained fairly bland with the canoe just floating around, something different happened briefly 3 or 4 times but it was short lived and felt a bit forced somehow. The highlight of the simulation was when some sharks showed up for a few seconds and ate the man from the canoe. I shall look forward to reading your daily sessions Thaomas - I really like this type of experiment. I would join you...but I'm a lazy bum and can't be bothered. The highlight of the simulation was when some sharks showed up for a few seconds and ate the man from the canoe. Thanks Selski, this will help keep me motivated to provide the entertainment, haha. I have been querying NPR on the truth behind the lack of success yesterday and have been given two answers. The first is that at no point was I close to sleep or a trance mindset, hence the visualizations were a struggle and didn't take on a life of their own. The second fact that was pointed out to me is that I have never been able to sleep during the day due to my energy and extreme mental activity levels - relying on falling asleep during the day to project is going to be additionally challenging by default. Thaomas, congratulations for trying this. But I do really see you are blocked. Right off the get-go, you were internally trying to "sabotage" any success. Like I said "any doubt will knock you out" and this "Around 7 minutes in I started receiving information that this session would not succeed. I pushed those thoughts away, although they were quite persistent. I didn't feel any attachment to them, need for success or expectations, yet I felt a deep knowing that they were correct, much like precognition." is known as harmful doubt. Now to the unknowing sabotage you created. First off, I said the idea was akin to and based on "Paddle to the Sea". You didn't need to view a little native American canoe with a small paddler in it. You could have chose anything else. The little native American canoe, with paddler in tow, automatically creates "expectation". Next, the instructions were simple saying you mentally walk down the road ahead of you until you get to that bridge. When you get to the bridge bend down and release the toy boat beside you, into the "flowing" waters. This was all "figurative". Meaning, you didn't need to visualize a place you already knew of. That in itself, once again, creates expectation. The "flowing" water would mean that the boat would follow some kind of current. Because this river/waterway was going to be imaginative, the simple thought of a flowing river immediately brings current, movement to the water, so the boat will be moving away from you and likely forward. You would simply be following it. Because it is a water way that you haven't seen or are familiar with, it would create a inner curiosity and have it's own path. Thus, once again, abating any expectations. I purposely chose that because just setting it free on a motionless lake, wouldn't yield any need for movement and thus you would witness inactivity. Every part of this was chosen because of "triggers". But you managed to subconsciously remove those triggers. Thus making this much harder to do. So, you got off to a rough start. But we will see where this goes now. I think I needed to see this myself, so I could understand how people can get confused with what I figured were easy directions. It shows I need to add much more detail to explanations and methodology that I share. Thank you for that! Sleep isn't a part of this process. A 30 minute meditative session is. How did you associate "sleep" with this? I figured the instruction of a couple minute "sneak peek" many times throughout the day would have drove that point home. I got in my bath, got comfortable, did some very brief 6 pt. directional focuses, then once I felt I was getting deeper, I began my process. My intent was on 4 things. #1 Mentally walking down a road to the bridge (not any specific road, nor bridge) #2 Releasing the boat beside me into the flowing waters ahead of me and #3 and #4 Allowing and Passively Observing all. So I start the game of fade in fade out. This happens for awhile. Now I can begin to see the road ahead. Just the road though, not the bridge. I begin walking, tactile sensations kick in. Soon I come across the bridge. It looks like a simple 1 way bridge, but it does have flowing water beneath it. I reach down to grab my boat, I put it in the water and see it's a "Submarine". Oh this should be interesting. I didn't create that. Like I said, I only had 4 intended things to do there. I didn't know what kind of "boat" it was. There was no conscious intent on it's design at all. So seeing a "Submarine" was a shock to me. But I still observed it and moved on. It looked like a plastic toy. It has a black body/shell, with red rudders/fins and red circle that's ringed around the "stack". Now I use my "targeted focus" and I follow it. It moves roughly in the flowing waters. Once in awhile the image fades and when I bring it back, something new has occurred. All of a sudden, I'm not behind it anymore. I am seeing through more of a first person view, but from that of being in front of it. This opens my "peripheral" vision up wide and completely. Because of that, not only am I seeing the waters from a view that I am the one flowing down the river, but I am also seeing the background quite vividly. When you begin this exercise, it's hard to just "hold" the focus on a simple road itself. Your peripheral vision seems non existent at that point. Now is when I become "side-tracked", but in a very unusual way. I begin focusing on the structure of the trees as I am passing by them. Then that vision instantly stops and I am working on new wire trees, according to what I learned of the tree structure I see in the passing trees. But here's the unique part. I am still passively observing that I am thinking of working on the wire wrap trees. This seems like some kind new layer. I was consciously aware of seeing that I was consciously aware of working on those wire wrap trees. It was like some kind of deeper split in consciousness. Right now I am consciously aware that I am typing here on the internet, on all levels. I am not sitting back and "passively observing" that I am doing that. In the experience above, I was. After a little while of working on new tree construction, I returned my focus to the boat scenario. MJ then knocked on the door and came in. She turned the light on to get a cotton ball for her son from the cabinet in the bathroom, then left. She left the light on though. So when I closed my eyes, my screen was a bit brighter. I didn't like that, I like my screen dark as it can be. So I aborted. I wanted to explain a bit more about the way I always use the term "allow". I have people saying, "they always allow". But do they really? Example, with most people, you can show them a very faded image and immediately their minds kick in to associate it with something. Case in point, I begin noticing and in the distance I see a shape. Right away the brain kicks into gear and attempts to focus on the shape. It's blurry, but now your mind has "filled in" the form. In other words, you have directed the thought. When I passively observe and allow, if I see a simple shape, I allow it to become what it wants. Once it is in good focus and clear, I use what I learned and I lock on it. This whole practice here also gives your "higher self" the opportunity to communicate with you with a message or some needed lesson. That's why I kept saying above that if at any time the scenario deviates from what it currently was, allow it to. By undergoing this exercise and ones like it, you have opened a "Doorway" or path of sorts within yourself. Allow yourself to explore it further. This is what daily practice teaches you. It teaches you how to hone your skills once you find yourself there. Thaomas, you have to "control" the situation. I don't have to always control everything. That's the difference between us. I learned to "allow" life to happen. I like to go with flow of things and then roll with the punches when they happen. I had a response typed up for Round 1 but the forums were down for a period and it is on my work computer. I'm going to skip to logging Session 2 and post the other reply tomorrow morning. I laid down on my deck in the sun and began noticing. I didn't have many thoughts going on this time and I got deep fairly quickly. It was nice so I just allowed this part to extend significantly longer than 10 minutes, it might have been more like 30. I had a couple of quiet rambling thoughts but no mini dreams. At some point an insect landed on my face and disturbed me so I was brought up from the deep trance. I resumed noticing for a while and after I felt I was deep enough I decided it was time to do the visualizations. I started by seeing where my boat was on the river and was met by stringent resistance. The visualization just really did not want to be at all. It was as if the deep mindset couldn't cope with the brain activity or energy levels required to do it. I kept trying to bring it back anyway, discovering what kind of river it was and trying to follow behind the boat from a distance. Ultimately the boat was proving too problematic so I decided to let it go and try a different visualization to see if the topic was somehow the problem. This time I decided to pretend I was playing a video game and it was lot a easier. After around 20 seconds of seeing myself play I fell into a deep train of thought regarding gaming in general. I noticed this had happened after a short time and brought myself back. By this point I had been laying down for maybe around 40 minutes and my arms had gone numb from the lack of blood circulation. I shifted them and resumed a mindful meditation, allowing another insect to traverse my hand for a while. I messed with some more visualizations but I had become too roused and decided to end the session there. Overall the points at which I was closest to an OBE was the deep train of thought that spawned off my video game simulation, and the rambling thoughts on the brink of mini dreams before I started any visualization. 1) The sleep level - we stay completely still and try to make our bodies fall asleep. The moment it happens our brains are allowed to move into the correct brain wave state, DMT is possibly released and the experience rapidly escalates. 2) The meditation level - by developing some special neural pathways and entering a trance or flow state we are able to change brain wave states and have some experiences without completely falling asleep. 3) The ascended level - with some kind of 3rd eye activation we achieve synchronization of the regular and sleeping brain wave states, allowing for open eye visuals and dual reality experiences while walking around. I think all of these states are physical conditions, by default the average person gets the sleep level, but for some reason we can't get beyond that without training. It might be because of social conditioning or things like calcification of glands in the brain. The meditation level is like a short-cut and stabilization of the necessary brain wave state achieved through repeated carving out of the neural paths involved. 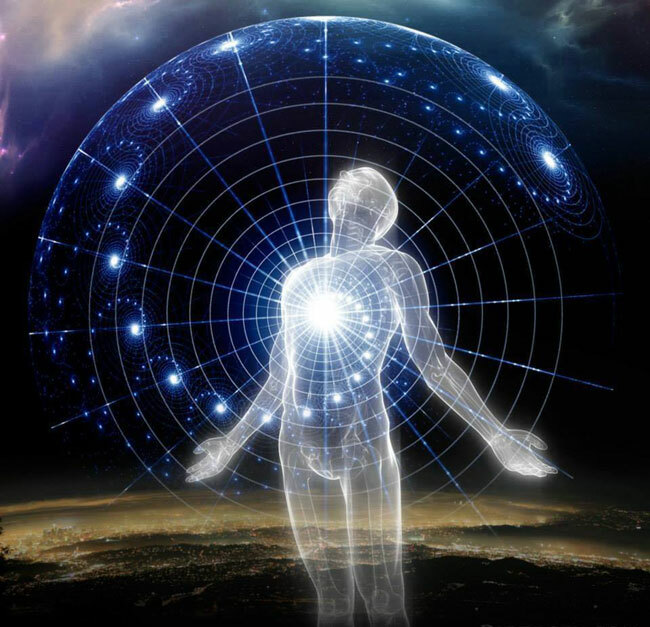 The ascended level happens for people spontaneously sometimes in extreme stress, but usually requires enlightenment and or peak physical health. I know it is possible to train the enlightened state for example through extreme physical feats that require full mental coordination to not die in the act. Athletes like Michael Jordan, but far more predominantly extreme snowboarders get this. Once it has been experienced enough times they can enter this flow state at will right before the sports event. I suspect that at the current level I am at the only way to experience a full blown OBE is to fall asleep. I lay down in the bath, get comfortable, but still have a "aching spine". The weather has changed quickly here in Minnesota. We went from the 70's down to the 40's very fast. The wind today is about 20-30 mile an hour too. Brrrr. That's one thing I learned about becoming consciously aware. It has it's pros and cons. Some of the pros and cons can be the same thing. Case in point, you have the ability to sense things and are more aware than the average human is. That means you ae open to much more, even in this physical realm here, like "empathy/people's emotions, psychic thoughts/premonitions, etc., but also things like weather changes as well. You have to take the bad with the good. So this isn't such a "good" day. But I still try. I do some relaxation exercises and etheric loosening to rid some pain. I then begin my "boat" focus. The fade in/fade out game begins and soon I can hold my visual a bit more. This one shows up spontaneously and it is me back in 1st person view from the front of the boat. I can't visualize the "Sub" at all. So, I just go with this and my peripheral vision opens further. A couple minutes of good locked on focus begins to fade and now I am back trying to get it back again. It seems to be a battle though. I am also still aware of the "knife stabbing" in my back, so loss of focus is understandable. But I don't give up. Some time goes past and finally imagery is beginning again. Once again I am in 1st person view from the bow/front of the boat. I see the water bubbling up ahead of me and finally notice why. We are about to go over a waterfall. This is very cool now. I watch as I am plummeting down the waterfall. I see the bubbles ahead and brace myself for what's next. I see a lot of tumbling and jumbling. But for some reason, I don't feel the tactile motions of it. Thank God though, that would be hard to handle. There was a lot of very violent tossing and turning going on there. That is one time that having no expectations really paid off. The scene soon fades and I am back to my physical focus again. Now I just continue to lay back and relax in the bath water for awhile. The imagery during this session was fast and a lot of "flitting"/jumping from view to view. My focus was off. My physical pain took over. It happens sometimes. Now, to my daily sneak peek results. I attempted to try to do this often. Just a couple of minutes of observing here and there. Some sporadic very fast scenes. Once again, a lot of 1st person view. Very rarely did I see the Sub, but when I did, it was either being bounced around in the wake of the water (when it was on top of the water) or when I viewed underwater scene, my toy boat looked like a "real" military style sub with props and rudders to boot. That was kind of cool seeing that. The underwater 1st person quick views were good too. I didn't get visuals every time though. Sometimes it was just blank and my eyes got a rest. I do want to say though that what you consider a failed session, isn't. You are learning to hold your focus. That kind of training does not occur immediately on demand. The average Human used to be able to hold their focus on one thing/their "attention span", for 12 seconds. Today, with the the "Technology" age, that has changed to 8 seconds. A "Goldfish" though, can hold it's focus for 9 seconds. One more than a Human. What an interesting little challenge. I read the instructions, didn't watch the video and just jumped right in before my thinker had time to actually do any thinking. I was following a path in the sand and quite clearly saw a long dock out to the sea. I was surprised to see a little toy sail boat right at the beginning edge of the dock. It appeared hooked on something. The boat was pristine white while the sail was blood red. I picked it up not sure if I should just release it there or walk to end of the pier. The boat seemed to 'squirm' like it wanted down. Before I could think about too much I put in the water right there at the edge of sand. It turned, hesitated, turned again then took off like a bat out of hell. I found myself with out much of a choice but to zip after it, fast. Way out in the middle of the ocean it stopped. I drew close and could see no reason for it. Then I thought maybe I should dive so did. When I turned to make sure the little boat was still there it took off again. I followed it for a while below water but soon came up and zipped after it above water. It entered an area surrounded by huge black rock rising from the water. I followed underneath the water zigzagging around black rock/coral. Shortly the boat stopped at an empass. No way to go forward.I dove around and saw that the I could take the boat underwater to the other side of the block. I did this but the little boat pointed its little nose back right at the block so I dove down and discovered a tunnel into the black rock. Then me ol' man interrupted me so ended this experiment. I was highly surprised at how quickly this scenario developed. I would have liked to put in the full 10 minutes, maybe next time. I want to add that I did this very quickly before reading any of the responses as I didn't want to pre-load anything anyone else experienced. After I posted the above I was surprised to go back and read Lumaza's description of his sub. Lots of similarity there.. Interesting. First off, hello Nameless. It's good to hear from you again! Welcome to the "Challenge". I like what you posted above, about the fact that you didn't want to "taint" your experience or "pre-load" anything. Very smart! I'm not surprised though! Your first adventure sounded fun. I think this whole experiment was "meant to be" and those that need to, that try it, will get something "new" out of this. I got into the bath water and immediately was able to turn the pain off. It wasn't bad like yesterday. In the past I would take "muscle relaxers" or Percocet to the do the job. But I gave those up months ago and now take everything on "mind over matter". Matter sometimes wins though! Today, "mind" prevailed. I begin the fade in/fade out for a few minutes and now a scene is quickly building. My view is from the front of the boat, looking backwards. So, I can't see where it's heading, but I can see a beautiful view of where it's been. This fades out. The next scene, which is really sharp now is the Sub looks like it's beached. It has been pulled up on the sand, just like you would "beach" a smaller boat at a lake. This place is definitely a lake like setting. There is sand on the shore, but the trees in background are not "palm trees". They look more like the beautiful trees we have here in Minnesota. But I can tell it's not "Fall" there, like it is here. The trees are green as green can be and in full bloom. I see a couple, a man and a woman, lying on a blanket on an area of the grass that surrounds the beach. They are just gazing quietly into each other's eyes. I hear or sense, (can't remember which) kids behind me. It sounds like a young boy and girl. My attention turns back to the couple though. I also get the thought that this is weird. I wouldn't have expected that a common family on vacation or whatever would be actually piloting the "Submarine". My focus then returned back to the man and woman staring at each other. All of sudden a very emotional feeling of "Love" hit me. It was so strong, so powerful. What they were experiencing and I as well was true "Bliss". It was amazing. I felt light and fluffy all over, lol. I then became aware of a faint purple "haze" in the distance. It was coming into view now and I could see it was some kind of semi-transparent purple "orb". It looked kind of "ghostly". It began moving slowly and as it did it would kind of morph it's shape. Not into a person or anything like that. It would move side to side, then expand side to side or expand/retract etc.. I stayed with this for visual for again what seemed like a eternity. Then as quick as it came, it left and in front of me was a small crowd "clapping". I guess I accomplished something new there. I then returned to the 3d darkness and knew I was really deep, so I decided to turn my focus to working on my new "Elemental Air Crystal Amplifier". Working on design in the 3D darkness it so cool. Because thought = action there, you don't need to physically do anything, like the physically move the piece, etc. This gives you the ability to create new things at will. Bringing them back or manifesting them in the physical 3D world is the hard part though. Working with the wire in the physical and trying to reproduce "exactly" what I saw, is next to impossible. I finally finished my wire "Tree of Love" last night. That took a long time to do. I did the design last week. But I wasn't really happy with it. I put it on the kitchen table so I would see it everyday and every time I looked at it, it just didn't "feel" right. I have been tweaking it here and there, but still not happy with it, until last night. I cut it off the Crystal and began dismantling it from the roots up. That is not a good idea for a number of reasons. One being you can totally destroy the whole piece. A small piece of Crystal had broken off the main cluster and I wasn't feeling good about. The tree now looked bad. MJ then came into the room. I told her about my predicament and she said, "I guess that piece" (the broken piece of Crystal) didn't want to be part of your design. That was very kind for her saying that. She then went to bed and I began reshaping the tree. I closed my eyes and relaxed my mind for a few minutes, then set upon the new design and it came out great. I will add a picture of it to my Photobucket page when I get a chance. Today's experience was very clear and left me in a great mood! My brief sneak peeks haven't yielded much more than a passing quick glance at the "Subs" surroundings. Almost every visual during my quick daily peeks has been from a 1st person point of view, as if I was on the boat or was the actual boat itself. I lie in the water, begin some quick relaxation and 6pt focus. Now I am ready to change my focus back to the Submarine. The usual fade in/fade out occurs for a few minutes. I don't feel as "in the zone", as I did yesterday. I decide to just relax in the 3D darkness and like usually happens when you just allow it to happen, a scene suddenly begins to grow. This scene starts with a image of being in some kind of huge "Gorge". I am on the ship, I think, taking this view all in. The hill tops are enormous. Once in awhile they lower a bit and when they do, I can see a bit of what lies beyond them. This one times it lowers I see some kind of white building structures, akin to "Nuclear Plant silo". This peaks my curiosity and I fly to the top of that peak to get a better look. I know I could have just thought "up". But I decided to take a more exhilarating path. The fight "up' the mountain was very cool. I soon saw that these weren't the white towers that I first thought they were. They were white, but they were sphere shaped, not "silo" shape like a Nuclear Plant's would be. There was a number of them scattered throughout the area. I went closer to do some further inspection and could not find any entrances/exits at all on these structures. They had the look of soccer balls cut in half. They had that kind of pattern on them. The thought had never occurred to me at the time that these could have been "Missile Silos" of some sort. I pondered that after my Phase session was complete and I was trying to understand it further. I then returned my focus back my ship and found myself in the 3D darkness, so I decided to just relax, then I ended the session. I start the process. Relaxation first, then a bit of 6pt focus. I now begin the "ship" focus. Fade in/fade out quite a bit. All I can see in the brief fades is a landscape, but no ship. A scene gets vivid now and once again it is a landscape. This times I feel the motion of moving forward and see that I am scanning the area. At first slowly, but the speed rapidly builds. I am flying over mostly water, but once in awhile a land mass will enter the picture and I will just skim over it. The feeling of flying over the water was really cool. I then briefly saw a ripple that moving weird, kind of like that of something begin pushed. I focused on it and soon found that I had dived completely into the water. It wasn't a hard transition though. The only thing that changed was the visual. Well that and that when I went into the water, there was a slow down in the speed of the movement. That soon changed and we were moving quickly again until I rose through the water and back to air again. Once again, that transition was very cool. The "searching" process goes on for the entire session until the scene ends (I never did find the Sub) and I return back to the 3D darkness for some "being". The 3D darkness is such a great place to just "be". No pain, no worries and many times, no thoughts. The only thoughts that occur are usually what my newest "Crystal Amplifier" is going to be. I finished Air last night. It looks awesome! Tonight, it's "Fire". This afternoon when I was finished my Phase session, I went and found a great piece of "driftwood" for my Tree of Flame, that I am starting tonight and I burned/scorched it with a torch. I want the base to be authentic. I wonder if the 'gorge' is the same one I saw in my shower several months ago? 500 foot tall peaks? Lumaza, so why do you alternate between keeping an eye on a submarine versus a boat? You guys sound like you're having such fun with this concept, I may have to give it a try! Forums have been down for me for last few days. I have been doing the sessions though. I'll post about them when I have more time on my hands, hopefully tomorrow afternoon. If you don't mind: what is this exercise supposed to achieve? It is a step to what? I guess this little scenario was just mean to be. It resonates well with me and a few others I see. Sorry to say session 2 and 3 here didn't rack up much. My little sail boat refused to budge and the one time it did in session 3 it only moved a few feet from the dock. This gives me a thought though. Will report back later. That's a thought EV, I'd love to hear what happens if you decide to do this. So far I have to admit I'm enjoying this one. Looking for to it Thoamas. baro-san, it's just for practice to develop better focus and learn to trust your instincts. Lumaza can elaborate more I'm sure. That sounds about right, EV. The walls were incredibly high, except for once in awhile they low enough to for me to see beyond them. That led to my curious visit to that weird city of white spheres. EV, in my first experience. I mentally consciously created or intended on seeing a road and a bridge. I blindly bent to my side and put my boat into the water and that's when I saw it was a "Submarine". The next times I went there and when I did my sneak peeks, I was looking once again for the Submarine. I felt that that was my "chosen" vehicle, so I latched onto it. I also used a visual of a Submarine, during my daily quick sneak peeks as well. The reason that a few time above, I switched the word "Submarine" to either "ship" or boat was that I got tired of typing the word "Submarine" so much, lol. I even used "sub" a few times. It is fun. It's new and fresh and also gives you a chance to see the "other realms" in a different way. Welcome aboard EV! The more people involved in this gives us better stats and more results. I had that problem before and still do once in awhile. I attempt to log onto the Astral Pulse and my computer says it's not accessible. 2 years ago, I was off he Pulse for about 2 weeks, because it said it was down. I didn't know the problems was mine until I emailed EV and Szaxx and they told me the site was okay. I then deleted all my "Cookies" and browser searches. I cleaned the "hidden" cookies as well. Then, I basically "defragged" and cleaned my entire computer and after that, I had no problem getting back on the Pulse. To strengthen your focus and be able to hold that focus for longer amounts of time. My Doorway technique does the same thing. When I am helping to teach a person and they begin having their own successes, I tell them "now drop everything I taught you and just notice". All my techniques are based on the same thing and that's getting you to the 3D dark zone, that's where the real Journeys begin. Every experience above that I had , had one thing in common and that was that they all brought me sooner of later to the 3D dark zone. I have read many articles and listened to many videos on the lives of Nostradamus, Nikola Tesla, Albert Einstein and many of brilliant minds of our past and saw the one constant. Each one opened some kind of "Doorway" within themselves. Each one of them utilized the "Akashic Records" in one way shape or form. The reason they all succeeded is that they learned not only how to tap into the "other realms" at will, but also how to "stay" there and in their cases work on projects using "thought = action". Tom Campbell told me the "NP" is just a simple shift away. "WE" just need to get out of it's way. It takes some people a lifetime and some never succeed in "getting out of the way". I talked to Tom a few times in the past years, via email. I told him about the weeks I had where simply closing me eyes yielded vivid, in your face" visuals. I told him the first occurred by accident in the "shower", when I got soap in my eyes and closed them, then saw that I was teetering at the edge of raging Waterfall. I lost balance, vertigo kicked in and I almost tore my shower curtains down, while trying to keep standing. He said I was shown a "sneak peek" on how it could be. That's what it's a "step" to! One last addition to your comment above Baro-san. I talked a few days ago with a person who is very experienced and who is also a close personal friend, via telephone. He mentioned about the fact that we get about 10 "bys" he called them. If we wished to see more, we have to work for it. I found this to be true as well. You are given many little "sneak peeks" in the beginning of this practice. But then one day it's not so easy and you might even find that you can't succeed in this anymore. That's when you need to pull your boots straps up and get to work. You need to "be" what you are learning. You need to have purpose for why you are doing it in the first place. At that point, the days of "Astral joyrides" seem to be gone for now and school has begun. This is when I set the mood, atmosphere, etc., lie back and mentally say, "Take me to where I need to be. Show me what I need to see". Then, I trust. It might not happen immediately. But my message/intent is answered sooner or later and it shows that it has come through, been heard, "loud and clear". I had to comment on this quote a second time just to say "Hmm, the shower". That's very interesting! EV, knows what I am talking about. I lie back in the bath water. I do some quick relaxation, this time aided by "bouncing" energy around internally for a few minutes. Then it's to some quick 6 pt focuses and I am ready to "see". I attempt to find my Sub, but don't seem to be able to hold my focus that good. There isn't much fade in/fade out, because there isn't much period, just flat blackness. This changes after about 10 minutes. My Submarine/ship focus seems to have been Hi-jacked by my working on my Fire Crystal Amplifier project. Last night I twisted and wrapped the wire, so they are hanging all over the place. But I could decide the design form there. I didn't know which way to take it. Today I learned and am going to do that once I log off here. I saw how I could create a cool flame look using the copper wire. I was also told the focus of this Crystal Amplifier would be on finding your "Inner Flame", because once you have found and strengthened your inner flame, your outer flame will grow and strengthen as well. I have found the "meanings" of each or should I say more of what they are directed towards, doesn't really match what my first thought would be. Example, my Recovery Tree's focus is on growth experienced "during" the recovery process. My initial thought of the name/title Recovery Tree would be to help a person recover from whatever their physical, mental, etc. problem itself was. I didn't initially think of the positive achieved in the growth experienced during the Recovery. My first thought on a Peace Tree was spreading/amplifying your wish of Peace/worldwide around, as a whole. But I then was shown that my Peace Tree would be directed/ amplified towards creating Peace "within" you. By doing that you create Peace around you. I completed the Tree of Amore, the Peace Tree, The Recovery Tree and a few days ago, the Air Elemental. All either have one of my new beautiful Crystals either attached to or they are mounted on one. This practice in general is responsible for my new Art work. I was never a hands on Artist, until a few months ago. Our Dragons are made my MJ, my better half. I was always the "Visionary" of the team. I also was the sales. Until a few months back, I had never even seen a Wire Tree before. Not of that stature. MJ has a small "beaded" Tree, it's made of painted wire, (that we got years ago), but not like any of the unique ones you find from some of the great Wire Tree artists. The visuals began spontaneously abut 3 months ago and I just laid back and absorbed all that info and the teachings I received in. Somehow, by opening the many "Doorways" that I found in the "Otherworlds", I opened up some kind of Channel. Kind of like a "Akashic record" for Wire Wrap Trees, if such a thing exists. Many times, I just began twisting the wire, not even knowing what I was doing, just to see the end result coming out really cool. Now, I close my eyes before I attempt to work on one and I try to "Channel" whoever it is that has decided to help me. I then give them my hands and get to work. Don't you just hate that when the "Sailboat doesn't budge", lol. I would take the opportunity then to take in more of the "landscape" there itself. I find that my curiosity will normally find some new kind of scenario just awaiting there. My quick daily sneak peeks haven't yielded much. Sometimes you just simply close your eyes and there is a full blown scene already, other times, you just produce a blank. If anything you got a couple minutes a eye rest! You hit the nail of the head. This practice is made to develop better focus and learning to not only trust, but to allow your curiosity to pull you deeper in. Not just to get better focus, but to learn the ability to hold it "there" longer. No more 10 second OBEs, or sneak peeks. Now you can sustain an experience longer, which helps you in any of the ways that you can achieve a non local/ordinary state of consciousness, whether that be Lucid Dreaming, full body OBEs, Phasing or any others.